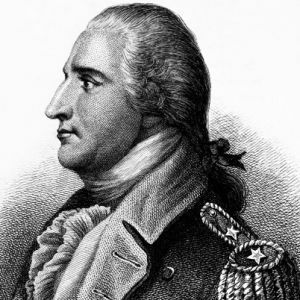 Born in Norwich, Connecticut, Arnold served as a teenager in the French and Indian War (1754–1763) and, during the American Revolution (1775–1783), compiled a brilliant combat record, but became embittered when he was passed over for promotion. In 1779, he married Margaret Shippen, the daughter of a prominent Philadelphia Loyalist. Accustomed to affluence, his bride encouraged Arnold to spend freely, and he was soon buried in debt. Arnold saw the British as a means of gaining both military promotion and ready cash. He offered them the plans of Patriot fortifications at West Point, New York. After his treachery was discovered, Arnold was commissioned a brigadier general in the British army and caused havoc in Virginia and his native Connecticut.